Most American’s start their day with coffee. In fact, according to Reuters, 64 percent have a cup each and every day — and more than one-third grab their caffeinated dark goodness on the go. Of course, there are countless ways to drink your coffee. You can have it strong, sweet, iced, hot or flavored, and that is particularly true at Starbucks. 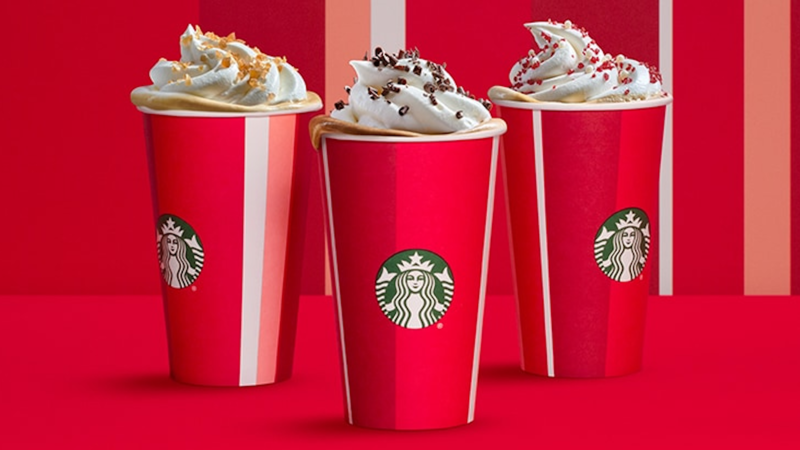 The international chain is known for their unique beverages… and the holidays are no exception. Everyone loves Starbucks for their seasonal drinks. But do you know exactly how many calories you’re chugging down when you order a grande peppermint mocha before your Target shopping spree? Well, we did some digging and determined which seasonal drinks have the most and least calories. *Note: The calorie counts (above) are for 16-ounce grande beverages made with 2 percent milk and whipped cream when applicable. Now, it’s important to note that yes, a dietitian would most likely advise against downing a 510-calorie drink, but you know what? If that drink makes you happy, order away, people! It’s all about balance, and there’s no need to make ourselves feel bad about enjoying a tasty holiday beverage a few times a year. So excuse me while I go grab my second peppermint mocha of the day.